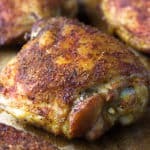 If you are looking for a tasty recipe that gives you the chance to let your smoker do the work, this smoked chicken thighs recipe is the answer. I’m all about easy smoked recipes. The rub is easily made with ingredients right from your pantry and the entire recipe takes only a couple of hours. It tastes so good you can even serve it at the holidays or on special occasions year round. I’ve used this recipe several times, mostly for family dinners. But, one time last year, we had some guests coming over and I found that the only thing I could throw in the smoker was some chicken thighs we got on special. Of course, I could have just grilled something, but I love to get the smoker going when we have guests coming. So, out came the family recipe for smoked chicken thighs. It was a hit! Our guests raved about the flavor and begged for the recipe. When I told them how easy it was, they were floored. They loved the tasty thighs paired with coleslaw, baked beans, and cornbread. But, these thighs are versatile enough to work with almost any side dish you have. Chicken thighs are naturally fattier and more flavorful than chicken breasts. When selecting a chicken thigh recipe, it’s important to keep this difference in mind. You want to bring the most flavor and juice to the table as possible. 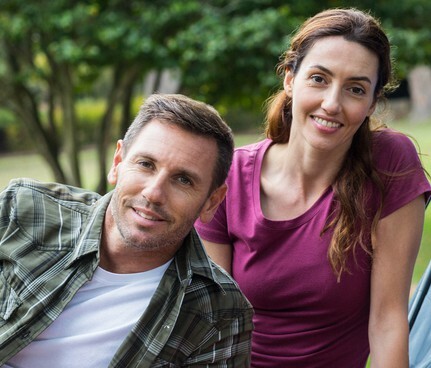 When you buy thighs in the supermarket, you likely see them with skin still attached. That skin helps retain the moisture in the piece as it cooks and also imparts additional flavor. A thigh recipe should not require the removal of this skin during the cooking process. You can remove it after if you want to reduce the amount of calories you eat. Thigh meat absorbs flavor quite well. The smoking process is perfect with chicken thighs because it absorbs the flavor of the smoke in a short amount of time. However, a rub, marinade, dredge, or braise will enhance the flavors, no matter how you decide to cook the meat. A good chicken recipe will require that you check the meat for temperature. Chicken needs to be cooked to a minimum of 165F. But, you also don’t want to overcook it as will dry out even the fattier cut of the thigh. Check the meat temperature often as you reach the recommended cooking time. You may find you need to pull the meat a few minutes early or let it stay in a bit longer to reach the 165F. The first thing I do when smoking chicken thighs is to trim the extra fat. I’m not talking about stripping the entire skin but scrape the excess fat that usually hangs off the edge of the meat. Once you’ve clean up the meat, it is time to work on the spice rub. There are a variety of rubs you can use for chicken. For this recipe, I used simple ingredients. Most the ingredients on the list you probably already have in your pantry. 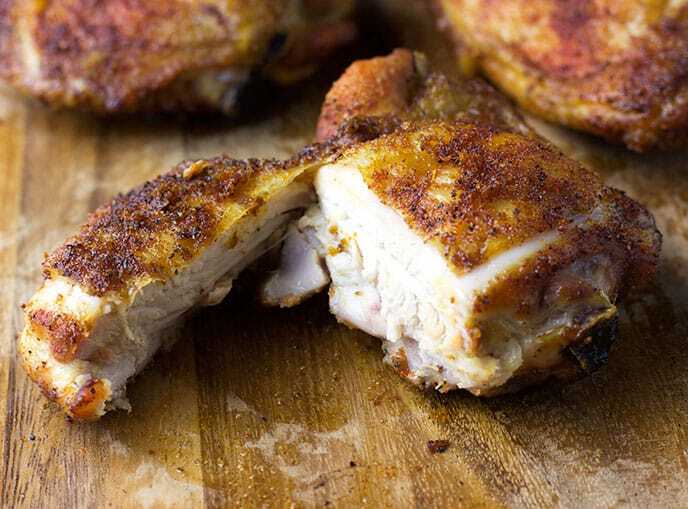 No matter what type of rub you use, the secret is to coat your chicken well with the spice rub. Both sides of the meat and even under the skin. You can also brine the chicken before smoking. I did not brine the chicken for this recipe but if you prefer to brine the meat, use a simple salt and water brine. Mix a cup of kosher salt with a gallon of water. 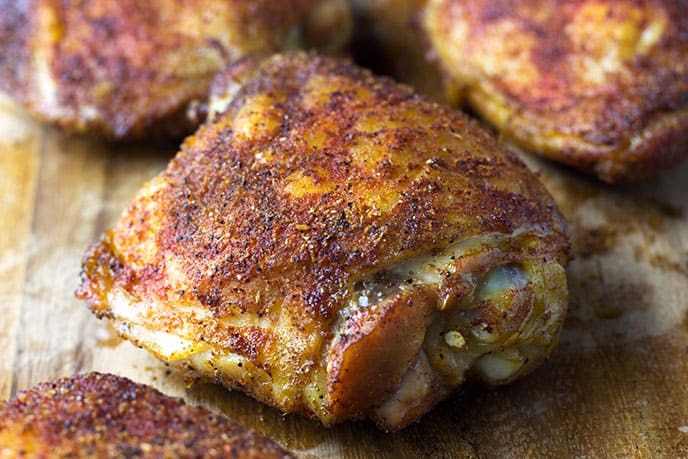 Try this simple chicken thigh recipe smoked for a few hours giving you that smokey, tender, and moist chicken. Place all rub ingredients in a shallow bowl. Mix rub ingredients together until thoroughly combined. Set aside. Add hickory wood to the smoker. Preheat the smoker to 250F. Use a basting brush to apply olive oil to both sides of the thigh pieces. Sprinkle a generous amount of the spice rub on each thigh piece. Press the rub into the chicken to ensure adherence. Place seasoned thighs into smoker. Smoke for 1 1/2 to 2 hours. The chicken thighs need to reach an internal temperature of 165F. Use a meat thermometer to verify temperature before removing from smoker. Let the chicken thighs rest 20 minutes before serving. 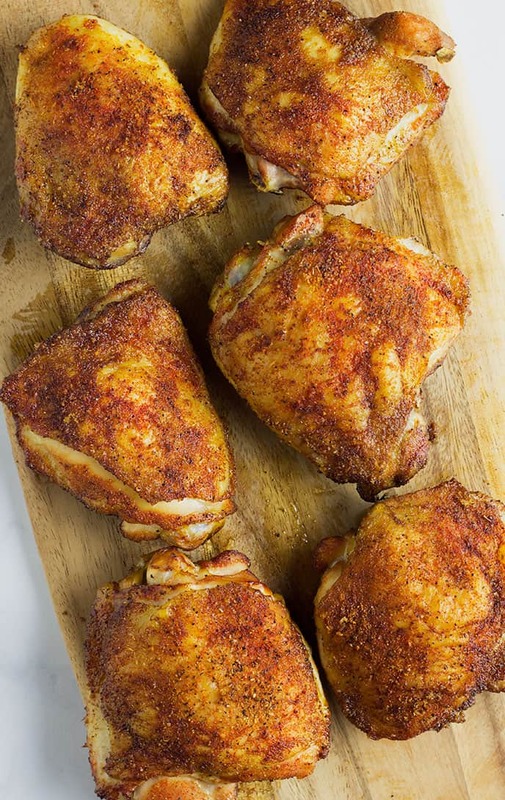 How to get crispy skin on smoked chicken thighs? You normally would need high heat to crisp the skin. So crank up the heat in the smoker or put in the oven at 400F. What type of wood to use for smoking chicken? Any kind of fruit tree like apple and cherry would go well for smoking chicken. You could also go for oak or maple. For this recipe, I used hickory.